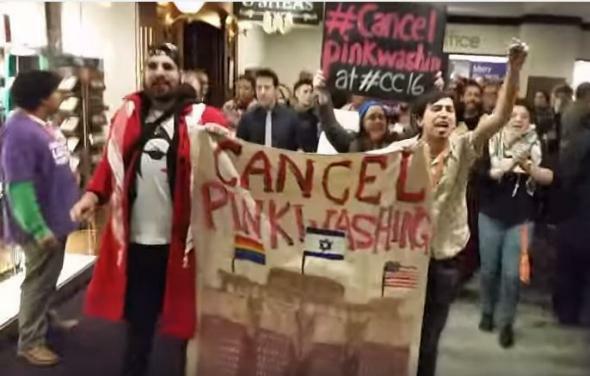 Pinkwashing, Creating Change, and anti-Zionism: Is protesting Israel necessarily anti-Semitic? Trauma Club: Was the Protest of a Jewish Group at Creating Change Really Anti-Semitic? Scene from the protest at Creating Change 2016. This post originally appeared in Jewschool. Nearly every published report claims the action was anti-Semitic. Some pieces call the protest “violent.” Most condemn the entire queer left, and call upon our radical movements to affirm support for Israel. And yet, while I have read these pieces, spoken to people who were there (on both sides), watched nearly an hour of video footage, and begged my wide-ranging social media contacts to send me proof of anti-Semitism, it was only after four days of searching that I discovered a verified incident of actual anti-Jewish bias on the part of one individual protestor out of hundreds. I am not discounting the possibility that other individuals may have made similar gestures, but why is the entire action — indeed the entire movement — being smeared as fundamentally anti-Semitic? Why are its base values and goals being falsely branded as anti-Jewish? I want to offer my own perspective on this flashpoint moment, because I believe that queer, anti-Zionist Jews like myself have a unique ability to empathize with both sides of this controversy without getting lost in the comfortable fantasy that Israel/Palestine is “too complicated” to take a strong stand. First, I want to clarify where I’m coming from. As an upper-middle class white Jew who grew up in the D.C. Metro area, I have a very conventional background. I was raised in a Reform synagogue, where my politically liberal parents were very active. My family taught me to critique Israel’s occupation of the West Bank and Gaza, but we never considered the notion that Israel didn’t have “the right to exist.” It wasn’t until I was an adult that I finally grappled with that idea. Did any states have the right to exist? Did countries themselves have rights at all? Why do we condemn an unequal distribution of rights in all states except Israel? When I eventually did come out to my family as an anti-Zionist, it was probably more painful than telling them I was gay. This is a fairly common experience for anti-Zionist gay Jews. As an anti-Zionist, I do not just condemn the occupation of the West Bank and Gaza. Rather, I think there is something fundamentally wrong with any state that privileges one ethno-religious group over another. In Israel, the national interests of the Jewish people are prioritized above all others. That is the country’s founding principle, and it manifests every time the state bulldozes a Palestinian home in Jerusalem to make room for a Jewish neighborhood, and every time a Bedouin village in the Negev is destroyed so the Jewish National Fund can plant trees. These terrors happen within Israel itself, and they are not simply a matter of bad policy. Rather, this violence is fundamental to the character of a supremacist state that distinguishes between “Jewish” and “Arab” nationalities, and gives different rights to each. It is the root cause of injustice there. From this perspective, as someone with experience in both the radical world and the mainstream Jewish world, I want to unpack some issues at the center of this controversy. Is it anti-Semitic to protest A Wider Bridge? When A Wider Bridge announced they were hosting a reception at the Creating Change conference, featuring speakers from Jerusalem Open House — an LGBT community center in Israel — the anti-Zionist queer left responded with outrage, and many people unversed in these politics did not understand why. From their perspective, A Wider Bridge certainly doesn’t seem partisan or right wing. From their perspective, Israel itself has a right to exist, and will inevitably have LGBT citizens, so why shouldn’t we celebrate LGBT life in Israel? Without a deep understanding of the politics at play, there appears to be no obvious reason to condemn an event like this, except out of disdain for Jews, or paranoia that Israel, because it is a Jewish state, is somehow the root cause of injustice in the world. Those are, of course, traditional signs of anti-Semitism: Jews being scapegoated for problems they did not cause, and persecuted unfairly for things they did not do. And since the individuals at this reception have probably never personally persecuted any Palestinians (although, with mandatory military service for Israelis, this is not a sure thing), I can imagine seeing this protest and thinking: anti-Semitism. But here’s the analysis from the anti-Zionist left, which I share: A major part of Israel’s strategy to maintain its unjust regime is to normalize and glamorize Israeli life, reinforcing the notion that a Jewish supremacist state is normal, natural, fun and interesting. This is especially important for nations that supply Israel with money, arms and other support, and no one does that more than the United States, which sends $3 billion dollars to Israel annually. Therefore any programs that aim to foster connections between U.S. citizens and Israel are also fundamentally nurturing a voter base that will bolster this supply of money and arms, which helps the Israeli state maintain its brutal policies and supremacist character with zero accountability or reason to change. When Israel or its supporters market to LGBT people specifically, encouraging them to visit Israel and form connections with Israel, this is called “pinkwashing,” or whitewashing Israel’s brutality with the veneer of modern gay life. From that perspective, A Wider Bridge actively participates in normalizing violence against Palestinians, even if its members do not feel as if they are, as individuals, directly hurting anyone, even if they are not taking orders directly from the Israeli government, and even if they are partnering with groups like Jerusalem Open House — an organization which claims a desire to transcend nationality. This analysis does not hinge on any particular opinions or feelings about Jews. It’s a political analysis, based on observations about political strategies, marketing and economics. You can feel free to disagree with an anti-pinkwashing strategy, or the larger strategy of Boycott, Divestment and Sanctions that aims to create punitive consequences for occupation, but I want any Jews following this controversy to understand that the aims behind these strategies are not based on anti-Jewish bias, but are rather based on political analysis, and descend from other major boycotts, like the successful boycott against apartheid South Africa. In fact, the fastest growing Jewish organization in the United States, Jewish Voice for Peace, supports Boycott, Divestment and Sanctions. This is a valid Jewish strategy, supported by a growing number of Jews. Many commentators have also focused on a chant used throughout the demonstration: “From the river to the sea, Palestine will be free.” They say that this chant is anti-Semitic because it implies that Israel should no longer exist. There was a time in my life when I, too, would have reacted this way. But what, exactly does it mean for Israel “to exist.” Does that mean it shouldn’t exist as a Jewish state? If Jews weren’t institutionally privileged under Israeli law, would Israel still be Israel? I believe that most Jews worldwide, when they are intellectually honest with themselves, would not support any state that privileges one group over another. It’s an inherently unjust concept. It doesn’t hold up to scrutiny. And yet, when someone calls to dismantle this injustice, we are afraid, because we think this can only happen with violence. We are afraid that, without state power, the Jews of Israel will be slaughtered. We are afraid that, without a Jewish state, we will have nowhere to run to if anti-Semitism rises in our home countries — as though Jews need a “back-up state” more than Palestinians need their homes. The chant conjures images of Jews “being pushed into the sea.” Certainly some Palestinian armed resistance groups have called for such things. Certainly many Israelis have been the victims of Palestinian militant violence against civilians. And certainly Jews worldwide have watched this violence and feared for our own safety. Now, aside from the fact that Israel has enacted far more violence on Palestinians than the other way around, it is clear to anyone who really looks at Palestine that its civil society exists far beyond the ranks of violent paramilitary groups and desperate stabbers. In fact, the past decade has seen a massive flourishing of Palestinian non-violent activism in towns like Bil’in and Nabi Saleh, where weekly non-violent demonstrations have gone on for years, or in BDS itself, which is the largest non-violent movement in the history of Palestinian resistance. Do we really believe that full human rights for all Palestinians will inevitably, in all scenarios, result in the extermination of the region’s Jews? Are we really so cynical that we cannot imagine Palestinians in their full humanity as people capable of kindness, even as they attain justice and equity? Why can’t we imagine a free Palestine freeing us all? After all, it’s less than a century after the Holocaust, and while there is still dangerous anti-Semitism in Germany (and even worse anti-Semitism further into eastern Europe) I can fly over there, make out with German boys, run around on the streets where I would have once been hunted as a double whammy of Nazi undesirability, and return home unscathed. Was this imaginable 70 years ago? 50? Obviously the situations are profoundly different in many ways, but the core lesson is valuable: that it is possible, after periods of seemingly intractable violence and hatred, with no hope in sight, for change to happen. Why have we so stifled our imaginations that we inevitably associate an oppressed people’s freedom with our own annihilation? And how can anything good happen while we cling to this cynicism? Is it anti-Semitic to scream with anger at a room full of Jews? When I started watching video footage of the demonstration at Creating Change, what I saw was incredibly familiar. I saw a buoyant, vibrant protest by young queer and trans people, mostly people of color (POC). I saw a familiar spark of playfulness, a familiar brashness and a familiar reactivity. Young activists learn quickly how to respond to threats in the context of a march — especially young queer and trans POC, who are disproportionately threatened by police violence. It is not uncommon, in protests like this, for the crowd to notice violence against a fellow marcher and rally around that person, shout at the perpetrator, and create barriers between hostile outsiders and vulnerable demonstrators. This is a normal thing to happen, and it was developed to protect lives. Another normal thing to happen at a protest like this is for demonstrators to prevent their opponents from speaking. In fact, this happens nearly every year at Creating Change, where keynotes are often stormed by POC activists who claim the stage and condemn structural injustice at the conference. While this might irk your average liberal who values dialogue and discourse, the strategy emerges from a deep frustration with being silenced by forces much larger than your average protest. In other words, when your opponents are supported by mainstream media — when you have to constantly explain your positions, in detail, because most people have never considered your perspective — it’s a fairly reasonable strategy to seize public platforms from those with wider influence. After all, pro-Israel forces have a vast outreach platform, with seemingly endless opportunities to talk to friendly audiences in the United States. The Palestine solidarity movement, on the other hand, is not only largely silenced in our society, but it is being threatened with legal sanction that could squelch free speech in a much more serious and far-reaching manner than the actions of any given demonstration. For example, the New York State Senate just passed a bill that would prevent the state from doing business with any companies or individuals that participate in the BDS movement. To be clear, the government would penalize people for exercising their First Amendment rights to political speech. If New Yorkers allow the State Assembly to pass the same bill, it will become law. Think about the difference in scale here. A small protest shuts down a pro-Israel event and we get a dozen op-ed pieces accusing the protesters of opposing free speech. But a massive pro-Israel campaign, backed by millions of dollars, partners with U.S. state governments to violate the constitution, and where is the outrage? Where are the First Amendment zealots? Where are all of the liberal Zionist Jews who claim to value the free and open expression of ideas? In a similar moment of disproportionality, many recent articles have accused the mostly-POC Creating Change demonstrators of being “violent.” I understand why the protest “felt” violent. A lot of people were squished into a very narrow hallway. It was a crowd-control nightmare. People who wished to attend the reception had to squeeze through the protest. Honestly, squeezing through any group of people that dense would have been uncomfortable, and if they all passionately oppose your politics and want to shut down your event, it would be exponentially so. But is this violence, let alone anti-Semitic violence? To my knowledge, the only person at the event who was injured by violence was a young Black woman protester who was hit by a reception attendee, and had to go to the hospital. Furthermore, when the venue called the police to break up the protest, they were subjecting a crowd of young people of color to the violence of arrest and incarceration in a city where police brutality runs rampant. Chicago, after all, is the city that covered up the police murder of Laquan McDonald and still hasn’t prosecuted the police officer who killed Rekia Boyd. This is not even to mention the regular police harassment of trans people of color that happens throughout the United States. So when you call the police on a group of queer and trans people of color, you are subjecting them to the very real prospect of violence and death. This is a far cry from the perceived violence of an angry crowd in a small space, at a conference where protests like this are so commonplace they’ve become practically routine. So, did anything anti-Semitic happen? I know that a lot of my non-Jewish friends will read this and be like, “WHATEVER.” They will point out the obvious, which is the extreme disproportionality between supporting an apartheid state and presuming that someone is wealthy. How could I possibly compare a brutal occupation to a stereotype that Jews have money? Well, I’m not comparing these things at all. I’m just acknowledging that they both exist, and they are both insidious, sinister and lead to suffering. As April Rosenblum points out in her insightful 2007 pamphlet, “The Past Didn’t Go Anywhere: Making Resistance to Anti-Semitism Part of All of Our Movements,” anti-Semitism is tangibly different from other oppressions. Anti-Semitism doesn’t necessarily function by keeping Jews poor and without resources — in fact, it actually requires that some Jews are visibly successful, so that the ruling class can use them as a convincing scapegoat during times of mass frustration with the status quo. Some of the worst moments of anti-Semitic violence, like the Holocaust and the Inquisition, occurred after sustained periods of abundance for Jews with access. So when non-Jews raise the stereotype that all Jews are rich — especially in moments of conflict — it turns the speaker into a pawn of the anti-Semitic cycle. So is this one protester’s one remark my biggest concern in the world? Is it as bad as supporting the injustice of Zionism? Is it as bad as pinkwashing Israel’s crimes? Is it as bad hitting a Black woman or calling the police on a crowd of queer and trans POC protesters? I think questions like this accomplish very little. A truly radical movement should care about all oppressions, in tandem with each other, because all forms of liberation are, by definition, linked. And what matters in the context of this demonstration is that the legitimate grievances of anti-Zionism not be obscured by a legitimate critique of anti-Semitism. The two things are not mutually exclusive. They must not be mutually exclusive. So why is everything such a mess right now? Why can’t those of us on opposite sides of this controversy see each other? Why aren’t we equipped to understand each other’s experiences? It’s partially because the radical Left doesn’t know how to recognize or respond to anti-Semitism when it does appear. And this is not just because of anti-Semitism’s uniqueness, or the way it doesn’t fit easily into traditional frameworks for imagining oppression. It’s also because we have grown so accustomed to anti-Semitism as a false accusation. Honestly, I hear far more false accusations of anti-Semitism than I do legitimate ones. It turns into a familiar dance, and it’s easy to go through the motions. I know that I have to fight internally, just to muster up the synapses to recognize real anti-Semitism. And that is because I am so used to debunking the ongoing cavalcade of scurrilous charges that so many Zionists issue whenever they feel uncomfortable or challenged. But even as the radical Left has difficulty grappling with real anti-Semitism, the mainstream American Zionist world has an even harder time understanding the existence of an anti-Zionist movement in the first place. And this is largely because anti-Zionist Jews have been effectively blacklisted from the mainstream Jewish world, through official institutional bans as well as informal shunning in families and social groups. With anti-Zionist Jews so ostracized, we are less capable of engaging with other Jews and explaining our movements, our allies and our perspectives. Without anti-Zionist Jews present and able to translate the ins and outs of the Palestine solidarity movement, Zionist Jews will become increasingly dysfunctional and over-reactive, which doesn’t benefit anybody. They will look at critique and see a pogrom. They will encounter a crowd of Black and brown protesters and call the cops. They will walk around in a constant state of panic and paranoia. But the truth is actually not that scary! Let us into the building so we can tell you that! As the Palestinian solidarity movement grows — and it is growing faster every day — demonstrations like the one at Creating Change will become more and more common, critiques of Zionism will become more and more visible, and those who believe in a Jewish state will increasingly have to defend their positions to a world majority that is outraged by Israeli apartheid. The easy answer for Zionists — on the left and right alike — is to continue to scream “anti-Semitism” at anything that makes them uncomfortable, to continue to shun anti-Zionist Jews, and to go on indulging in a fantasy of perpetual, righteous victimhood. The easy answer for the Palestine solidarity movement is to continue to use the power imbalance between Israelis and Palestinians as an excuse to ignore the very real threat of anti-Semitism against Jews worldwide, and to continue to plunge forward with discourse and actions that sidestep anti-Jewish oppression rather than dealing with it head-on. And so the bigger question isn’t whether any given action was or wasn’t driven by anti-Semitism — it’s whether we as Jews can overcome our collective trauma enough to see the difference, and whether we in the Palestine solidarity movement can manifest a commitment to Jewish liberation that is inherently linked to a free Palestine. *A “mekhitza” is a traditional Jewish barrier that divides men from women, so they cannot see each other during religious services.